Sure, catnip and rawhide bones are always pet pleasers. But here are some unique goodies for those truly spoiled pets! Fido and Fluffy have it made. 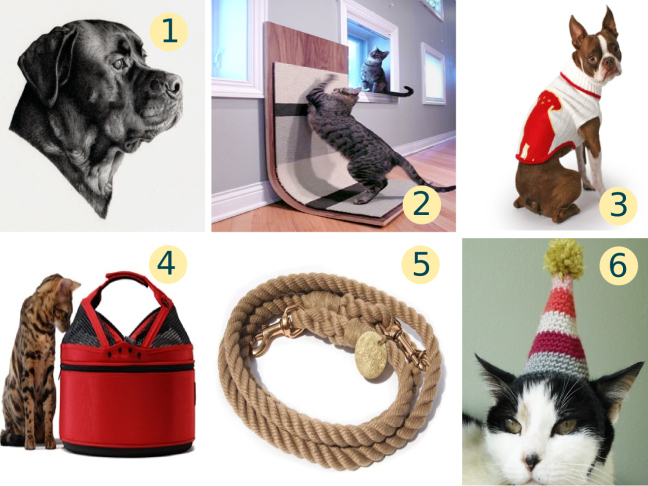 These days, pet-spoiling is made easy with the gaggle of awesome, unique pet products out there! Dress up your pets with warm sweaters or fun party hats, and make their trip to the vet (or across country) a little more bearable with a pet carrier that’s got all the bells and whistles. Even cat scratchers and leashes have gone hip – handmade details and modern design make these standard goods one-of-a-kind. And what pet wouldn’t feel on top of the world with a custom portrait of themselves hanging up for all to see?